The second annual Blogging While Brown conference concluded yesterday in Chicago, presenting a recharged enthusiasm for the potentials social media tools can present for digital activism. In what was possibly the largest gathering of African American bloggers and web content users since the election of the "Internet President" Barack Obama, there is a call from many in the black community to use Web 2.0 to actively campaign more on behalf of issues of most concern. The online organizing and fundraising around Jena 6, led by Web-based activist group Color of Change, to date is still considered the most successful Internet campaign among African Americans. However, the ongoing protests and digital activism in the aftermath of Iran's presidential election last week have brought up some new thoughts on how the African Diaspora could handle social movements - past, present and in the near future. Some conference attendees wondered if the civil rights movement of the 1960s, the Rwandan Genocide and the start of violence in Darfur could have had different outcomes if today's communications tools were around at the time of these events. "What if black bloggers protested the Bush administration after [Hurricane] Katrina, like the Iranian protesters are doing now with their government," said one attendee. "We can learn a lot from the Iranians." There was also discussion about how the black blogosphere will hold the first African American commander-in-chief and other politicians accountable on various domestic and international issues, such as health care, education, the war on terror, environmental justice, drug and criminal reform, unemployment and AFRICOM. However, many agreed that possibly the next digital battle should be to make sure that the Internet is accessible to all. According to Megan Tady of the media reform group, Free Press, only 40 percent of Americans have access to broadband. When that number is broken down by ethnicity, Emarketer statistics show that African Americans make up 13.4 percent of the U.S. population, but only 48.7 percent are online. Mobile technology is a widely used tool in this demographic, and text messaging was used by Katrina survivors after the storm. With all the above discussed topics, clearly there is a yearning to take advantage of the new digital era. Gina McCauley, BWB founder, said she will make efforts at future conferences to make sure attendees will have all the available training to stay on top of their social media skills. "Now is the time for us to stay ahead of the curve on this technology so we can make a difference in our community," she said. Apparently, summer begins today, but the weather forecast for my hometown is a raw, rainy 60 degrees. Nonetheless, I still want to be hopeful for a better day. "Everything is everything...What is meant to be, will be...After winter, must come spring...Change, it comes eventually"
Blacks Gone Geek's founder Milt Haynes gave some tips to conference attendees on Internet marketing. He uses blogs, podcasts, RSS Feeds, Facebook groups, Groupsite.com, Yahoogroups and his web site to network with an online community of African American IT professionals. Personal branding strategist Hajj Flemings shared his knowledge on how to stand out from the cyberspace pack. He argues that one's online presence can make or break anyone's career today. Consistency in how a person presents themselves in various social media tools is key to success. On a panel discussion on "Bloggerpreneurs," bloggers who have made significant money off of their social media discussed their secrets to success. Frederic Mitchell is a Chicago-based web developer who is proof of who you know and networking can help anyone become successful. He also said that complimenting others when they do good can work in your favor in the future. He is a strong advocate of African Americans becoming leaders in the tech world. Blogging While Brown this weekend! This weekend we will be liveblogging from Blogging While Brown, the only international conference for bloggers of color, which will be held this year in Chicago. We will bring you both the triumph and drama that will occur during this most important convening. We will also be looking out for discussion on how the Obama White House has flipped the script on how African Americans engage in technology. Victory in the Niger Delta? There is not enough money in the world to pay the true amount due to the Ogoni people. Two U.S. journalists, who were detained in North Korea while covering the plight of defectors living along the China-North Korea border, have been sentenced to 12 years hard labor in prison, the country's state-run media said Monday. The Central Court of North Korea sentenced Laura Ling and Euna Lee for the "grave crime they committed against the Korean nation and their illegal border crossing," the Korean Central News Agency said. As a result, the court sentenced the women to "12 years of reform through labor." A U.S. State Department spokesman, Ian Kelley, said the Swedish ambassador in North Korea confirmed the sentence with North Korean authorities. Sweden represents U.S. interests in North Korea; the United States does not have formal diplomatic relations with North Korea. Hold up, Mrs Clinton! While it is despicable what the North Korean government is doing to Laura Ling and Euna Lee, when does the U.S. begin to practice what is preaches for Ibrahim Jassam, who has been in U.S. custody since last September? No formal accusations have been made against Jassam, and an Iraqi court ordered in November that he be released for lack of evidence. But the U.S. military continues to hold him, saying it has intelligence that he is "a high security threat," said Maj. Neal Fisher, spokesman for detainee affairs. The Obama administration harshly criticized Iran for its imprisonment of Roxana Saberi, the U.S.-Iranian journalist who was convicted of espionage and sentenced to eight years in prison before being freed two weeks ago. Secretary of State Hillary Rodham Clinton criticized Iran's treatment of Saberi as "non-transparent, unpredictable and arbitrary." 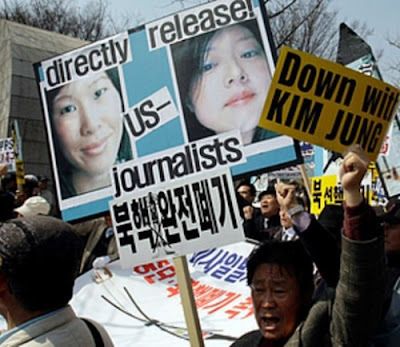 Washington also has called upon North Korea to expedite the trial of two U.S. journalists being held on spying charges. Yet the U.S. has routinely used the arbitrary powers it assumed after the Sept. 11, 2001, terrorism attacks to hold journalists without charge in Iraq, as well as Afghanistan and Pakistan, the Committee to Protect Journalists said. None of the detained journalists has been convicted of any charge, undermining the United States' reputation when it comes to criticizing other countries on issues of press freedom, committee executive director Joel Simon said. "The U.S. has a record of holding journalists for long periods of time without due process and without explanation," he said. "Its standing would be improved if it addressed this issue." Reuters has expressed disappointment over Jassam's detention and has said there is no evidence against him. Sami Haj, a cameraman for the TV network Al Jazeera, was detained by Pakistani authorities as he tried to cross into Afghanistan in 2001 to cover the offensive against the Taliban. He was turned over to the U.S. military, which held him for six years at the detention facility in Guantanamo Bay, Cuba. He was accused him of being a courier for militant Islamic organizations, but was never charged. He was released a year ago. In Iraq, Associated Press photographer Bilal Hussein was held for two years without trial before being released in April 2008 on the orders of an Iraqi judge under the terms of an amnesty law. The U.S. military maintained that Hussein had links to insurgents, but the AP said the allegations were based on nothing more than the Pulitzer Prize-winning photographs of insurgents that he had taken on the streets of Ramadi, in western Iraq. Jassam is the only Iraqi journalist still in U.S. custody, the last to be detained under wartime rules that predated a U.S.-Iraqi security agreement signed in December. Under the new accord, U.S. forces must obtain a warrant before they can arrest an Iraqi citizen. What if Tiananmen Square happened today? This week commemorations are occurring worldwide in observance of the Tiananmen Square protests and massacres of 1989. With the rise of Flickr and Twitter used for social justice, many digital activists wonder out loud if the now famed events would have transpired differently had social media tools been around twenty years ago. Clearly, the Chinese government knows the power of cyber-activism, as they have blocked most Internet social networks and foreign newspapers in the country ahead of the anniversary. Although there is an online blackout in China, activists still find ways to get their messages of protest out. Twitter has been blocked for the last two days, nonetheless, users worldwide have been using the hashtag #fuckGFW (Great FireWall of China) to express their outrage at the online blocking. Chinese blogger Xavier Lur said on his website TechXav that the Chinese officials created the drastic blockade to not only protect national security and prevent anti-government content from being seen, but it may have also been economics. Without blocking Google, Baidu cannot success. Without blocking Wikipedia, Hoodong cannot success. Without blocking Blogger, Blogcn cannot success. Without blocking YouTube, Youku cannot success. These huge International Internet Companies do not pay taxes to China Government, but the Internet Companies in China do pay taxes. The Chinese government wants to make more bucks, so and to boost their GDP. Also, they want to “protect” China websites and hence blocking successful International websites. "Ellen" (she asked to not have her real name used) is a Chinese college student and blogger who was only a toddler twenty years ago. She says that as much as the Chinese government tries to block the Internet, they will eventually realize that censorship will increasingly be hard to regulate as more people get connected. "The revolution is happening in cyberspace," she said. "If Tiananmen happened today, the government wouldn't be able to suppress anger towards them around the globe. I might not see YouTube or read blogs in Beijing, but someone else can in Singapore, in Cairo, in Nairobi, in Rio, in London, in New York. My country is fighting an uphill battle, and it needs to put up their white flag." First the banks, now the auto industry. Scan the coverage today of GM's bankruptcy and you'll see a wide range of reaction, from predictions of certain doom to sheer uncertainty about the company's eventual fate. The word "gambling" comes up a lot in reference to President Obama's plan, never a good thing when you're talking about amounts of money ending in 10 zeroes. What you don't see this morning are predictions of success. It's difficult to find more than a handful of analysts or commentators in the mainstream media (outside of Detroit) who believe that this blueprint is likely to work. Not that it might work, but likely to work. And that is worrying news for the White House, which is working desperately to forestall the company's complete collapse -- and the subsequent economic shock wave -- but may instead be fostering the public perception that it is throwing good money after bad without a clear endgame in mind. A Rasmussen poll released Sunday pegged support for the GM plan at just 21 percent, with 67 percent opposed. A clear majority of respondents would rather let the company go out of business than provide any more government funding. Congressman Dennis Kucinich of Ohio urged the White House not to subsidize GM’s overseas growth at the expense of US workers. In a statement, Kucinich said, “We must not allow GM to use US taxpayer dollars to close plants in America in order to open markets for products made in China and other countries.” Residents of Detroit said they were saddened and anxious by the bankruptcy of GM. I ask you Mr President: who will hold GM accountable on behalf of American taxpayers?